10 Dance Vol. 2 Review – AiPT! Of all the new series I’ve read recently featuring queer characters, none made a better first impression that Inouesatoh’s 10 Dance. 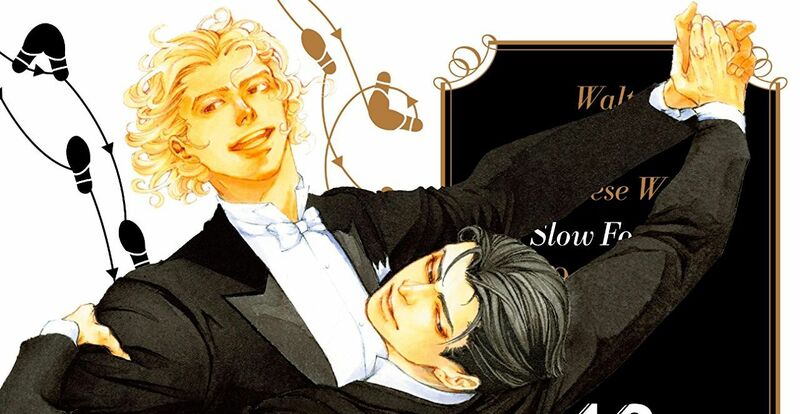 The ballroom dancing romance manga stars Shinya Sugiki and Shinya Suzuki, national champions in two different types of dance. They begin teaching each other their respective specialties, and sexual tension arises between them almost immediately. Vol. 2 continues the pair’s passionate pseudo-courtship as they ponder what they mean to one another and Sugiki’s past is dived into with more depth. Are the characters’ struggles depicted effectively? Is 10 Dance Vol. 2 good? This series continues to deliver excellent artwork. The shifts between scenes when the characters are dancing and when they’re not couldn’t be more apparent. The depictions of dancing here are downright ethereal with fluid compositions, beautiful shading, and abundant usage of sparkly patterns. The flow of motion here is crucial, and thankfully Inouesatoh nails it. The ebbs and flows of the characters’ bodies and their backgrounds lead the reader’s eye effortlessly across the page. With all that said, the art still looks good when the characters aren’t dancing, it’s just comparatively subdued. The characters’ facial expressions and body language are fantastic throughout. The sexual tension between the two Shinyas is palpable, and it’s a joy to watch them dance. All in all, the manga has a very expressive, atmospheric look that matches both the sport and the protagonists’ intense emotions. Sugiki and Suzuki’s romance is also well-handled from a writing standpoint. The dialogue throughout is witty and flows smoothly. Both men have consistent, well-fleshed out personalities and watching them bump heads continues to be entertaining. Neither of them entered the story thinking of themselves as a queer man, so they’re dealing with their intense romantic feelings from a uniquely blurred lens. Inouesatoh does a good job balancing the confusing and the obvious, delivering a believable depiction of two men who only have a semi-lucid grasp on their own feelings. Though we see the two Shinyas interact at dance practice and in mixed company, this volume’s most telling moments occur when they’re alone and just talking. There’s a definite sense of awkwardness to these interactions, and it works. On the down-side, the manga suffers a little bit whenever other characters are involved. Naturally, the supporting cast members aren’t the story’s highest priority, but they come across too much like afterthoughts. This is especially the case with the protagonists’ female dance partners, who remain quite undeveloped. There are also periodic clarity issues with regards to who’s speaking when. My last con is simply that the pacing in the middle feels a tad off, like certain scenes needed slight adjustments in page-time. This is relatively minor and unobtrusive, however. All in all, 10 Dance Vol. 2 is an enjoyable follow-up to one of my favorite debut volumes of the year thus far. The sexual and romantic tension between the two Shinyas is incredible, and their intense yet confused emotions are very well-conveyed. The art also impresses with expressive faces and lovely, ethereal-looking dance scenes. The pacing and utilization of supporting characters could use a little fine-tuning, but I would still highly recommend this volume. An enjoyable follow-up to one of the best debut volumes of the year.